This is some seriously exciting news, my friends. I literally cannot count the number of times I’ve been asked for a course or workbook on how to paint watercolour florals. But guess what? I am NOT a pro at painting! So instead of depriving you, or attempting to create a workbook myself, I did you one better. 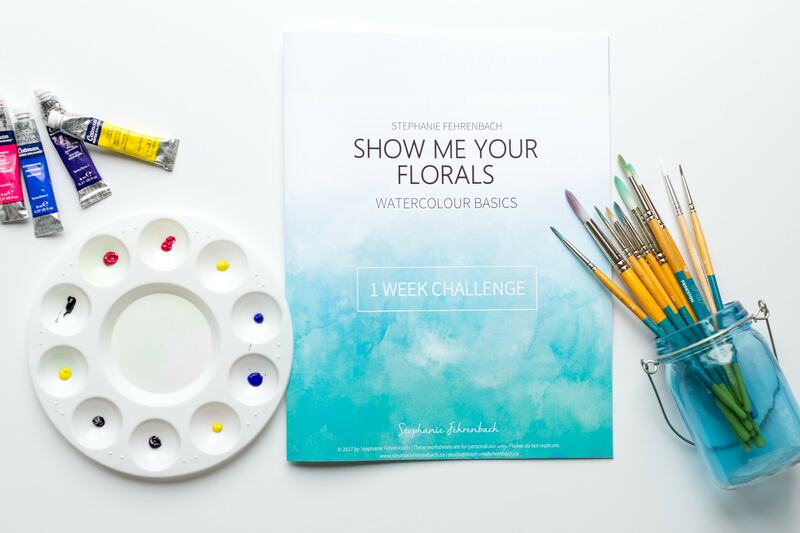 I’ve teamed up with the incredibly talented Stephanie Fehrenbach to bring you guys a brand new challenge…. learning how to paint watercolour florals! Seriously, this chick is amazing. I’ve had the pleasure of teaching alongside her in a couple of live workshops, and I’ve learned everything I know about painting from her! You can check out her beaaaaautiful Instagram feed as proof of how friggin’ good she is! -First of all, its completely free. 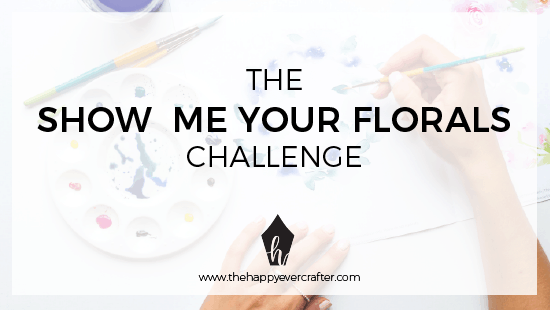 -You post photos of your daily progress in The Happy Ever Crafters Facebook group and/or on Instagram (using the hashtag #ShowMeYourFlorals) to get feedback from your instructors and peers! …and then ultimately, by the end of the week, you’ll be armed with a new skill at painting fun, beautiful watercolour florals! Got questions? Stephanie’s got answers! 1. I have NO experience with watercolour. Can I still join? ABSOLUTELY. 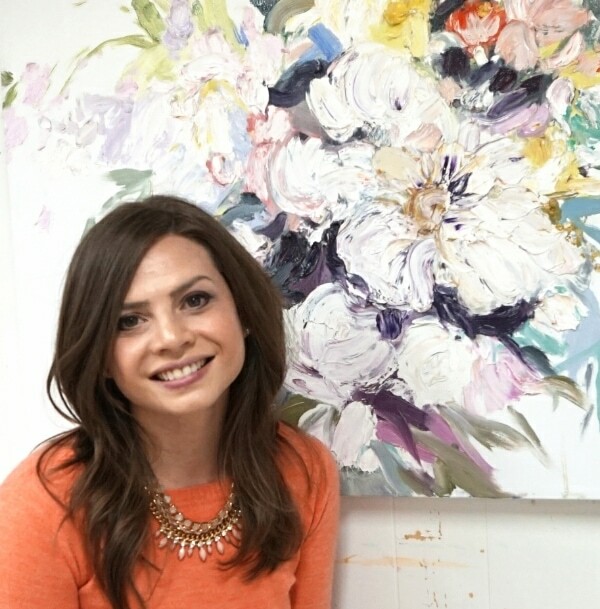 This challenge is PERFECT for you- I will take you from the very very basics all the way to painting florals. 2. What sorts of things will we learn? 4. Can I sign up after April 9th? Yeah, sure- but you will have missed some info. Try to make sure you’re signed up and ready to go before then! 5. Who will be sending the emails- Becca or Stephanie? 6. What supplies do I need? Great question! As soon as you sign up, you will get an instant PDF download with a full guide to the recommended supplies! You’ll have between the time you sign up and April 9th to gather everything! 7. I can’t afford to buy all of the supplies on the list. What should I do? No problem. If you want to invest only in a smaller kit, here are the most important pieces to buy. For paints: You will be able to complete the challenge using these colours only if necessary- Permanent rose, Lemon yellow, Mauve, Cobalt blue, Phthalo green. For brushes: For the challenge, sizes 0 and 12 will be used most often. Omit the other size brushes if you can’t afford them! 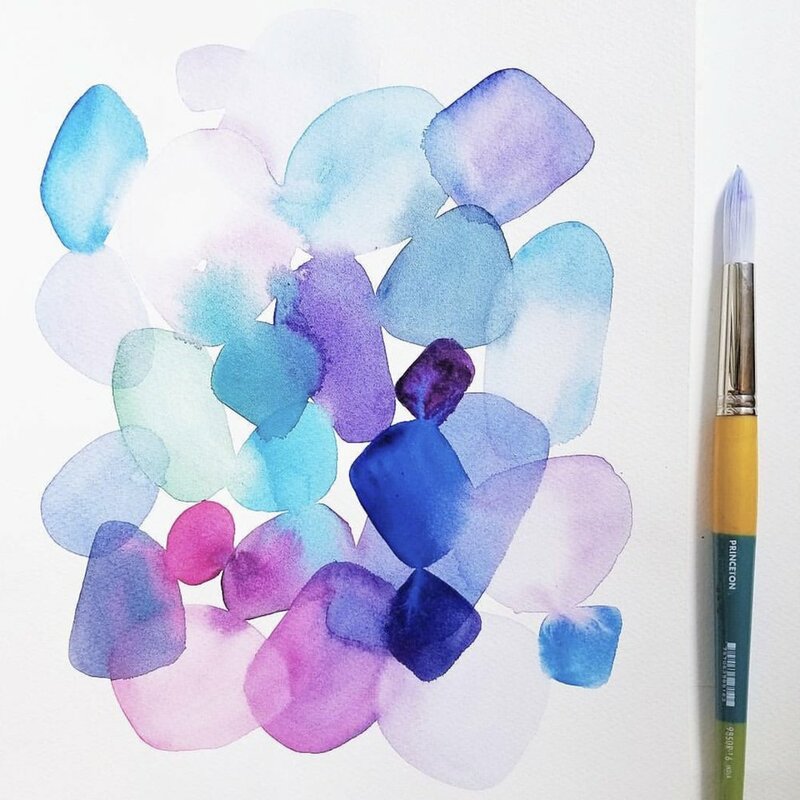 For paper: Watercolour papers can vary in price quite a bit, but for practice, you should be able to get away with any cold pressed paper from your regular art store. 8. I already own some watercolours, but they’re not the brands you’ve listed in the supplies guide. Can I use them? Sure, you can! Just understand that you may have a hard time matching exactly what my examples look like, since your colours may vary a bit! 9. I want to use a watercolour pan set instead of tubes, since I already own it. Is that ok? I like to use tubes rather than dried paint palettes because I find it easier to get more saturated paint on my brush and I find the colours look more vibrant on my paper. If you want to use a pan set instead — of course you can!! You’ll still learn the techniques and how to put leaves and flowers together step by step, they just don’t have the exact colours I’m using all together so your colour mixtures won’t turn out quite the same. As long as you’re aware of that, feel free! 10. Will there be a follow-up workbook for purchase, just like Becca does with her ShowMeYourDrills program? Of course! In the free 1-week challenge, you will learn all of the basics from the ground up, all the way to creating a floral bouquet. After that, if you fall in love (which you will, spoiler!) there will be not one, but TWO workbooks on sale to teach you a ton more different florals & more, step-by-step! 11. Will this be available for the iPad, like ShowMeYourDrills was? YES! Exciting, right?! Karin (@ipadlettering) has made this program totally accessible for the iPad, as well! Still have questions? Leave them in the comments below! Will I be able to access the video and drills after that week? I will be leaving for Egypt (from the US) that week and I’m not sure if I will have time with my travels! Hey Maddy- yup, just save the emails with the videos and the content, and you’ll be able to come back to it! Have an amazing trip! Similar situation here. Work travel for most of that week. I have already purchased the supplies, as I assumed I could access after the week was over! Yes same question – will the email content be available after the week? I’ll be traveling as well. same question as others… I am leaving Wednesday on holiday (away from emails..) AS long as the emails are in my inbox (unread) can I access them the next week? and follow up with the course then? I have supplies ready to go. Ive signed up and got the First email. I clicked on the link but then I havent recieved any email. Am I doing Something wrong? I had the Welcome to ShowMeYourFlorals email, but today I haven’t received the first class yet. Have I do something else? Thanks! I think we’ll receive the first class on Mon April 9. I have loved all the videos and am having such fun practicing. I do have a question if Karin will have a manual available that gives the step by step prompts to create the flowers in written form. Sometimes the process is too fast for me to catch up to get the right steps. Thank you for this course. Great as all of your workbooks have been! Hello! I heard about this via Boho Berry on Instagram but I am coming to it late… I have tried signing up but I am having problems (it kept saying try again later). Can you please help? Thank you, can’t wait! Does the iPad version come with watercolor brushes?? How does the iPad version work. Is it through procreate? Is this the same as the one you did last year? If anyone is having trouble finding all the colors for a reasonable price, DickBlick.com had all of them as of today (4/6) at 8:30 pm. Amazon’s prices were 2x Blick’s, or more, and Michael’s was out of 5 of them (probably because of this class!). Blick’s paint prices were comparable to Michaels. I found EVERYTHING on Blick’s. I’m so excited to begin this journey! I hope I don’t have any problems with the time zone ( Costa Rica), but I hope to be notice if you made a facebook live video! I signed last year but never received any of the emails. I signed up for the new course last week and I still haven’t received an email again! I just signed up again, a third time. Just wondering how to fix this? Will these videos be saved here so we can come back to them if we missed a day…..last time i had trouble on Vimeo trying to retrieve videos, and didn’t get the full course. Thank you BTW for offering it again. Hopefully this time life won’t get in my way. Hi. I’d love to do this but have only just seen it now, a few days late. In the FAQs it says I’ll miss information if I sign up late…shall I just wait for the next class? Any idea when it will be? Thanks so much, it looks like an awesome opportunity! Hey Lisa, you can totally still sign up and get everything you’ve missed, no worries! 🙂 There is no next class lined up yet, so I would suggest signing up now! Hi, I have only just found out about this and I am way too late. I still need to go and buy my supplies and it’s Friday already,. Will you be able to send me the emails I missed so that I can catch up later? 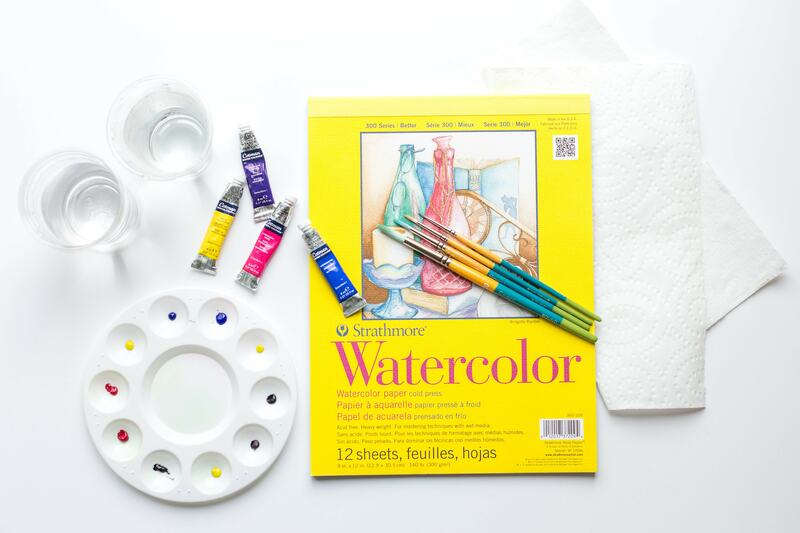 I’ve always loved watercolour and fancied having a go and this looks so perfect for getting started. The things I’ve seen on Instagram look beautiful!